Is the Houseparty App Safe? A Complete App Profile for Parents. Description: Houseparty is a really fun way to have a group video chat – almost like FaceTiming with up to eight people at once. As of a recent Forbes article, it now boasts over 1 million daily users. Does anyone remember Meerkat, the now defunct live streaming app Houseparty has risen from the ashes of Meerkat. Users invite people to join their “party” with a text message. In June 2018, they released a version of Houseparty that also works on your Mac computer. Each time you open the app, you are instantly connected with any contacts who are also on the app, giving you the option to start a group chat. For a more private chat, you can “lock” the room so others can’t join. When a person who is not your direct friend enters the chat, an alert is shown, giving you the chance to exit the conversation if you’d like — or meet someone new. Users can send photos or even send a “side text,” which is a private conversation with someone in the chat, which disappear after 24 hours. Each Houseparty user has a unique invite code that is accessed through the plus symbol in the upper right corner. When clicked on, the plus automatically opens up a text message that includes the code, inviting friends into a video chat. What do parents need to know about the Houseparty app? What about privacy concerns? Houseparty is live streaming, which means kids need to be aware of privacy risks. During the set-up process, users are asked to give Houseparty access to (1) camera and microphone, (2) notifications, and (3) location. You can opt out of allowing location access, which for a teen user, we highly recommend. Also, the app will state that a user’s profile is incomplete without including their birthday. We don’t believe that the birthday is necessary. It’s 50% of the identity theft equation (that plus the last four digits of your social security number). We recommend not ever including it in digital environments (including Facebook!). Don’t forget – everything can be screenshot. There are no second chances with live conduct. And, iOS now allows for an easy screencast (video recording of what’s happening on the screen). What about strangers? Houseparty does not use any age verification for its users (which aren’t very effective anyway). Naturally, in any social media, especially one that provides “live” contact, there are going to be individuals trolling around for access to unsuspecting young people. Make sure your child knows exactly what to do if a troll shows up. Even better, tell kids to use the “lock the chat” for a more private experience. 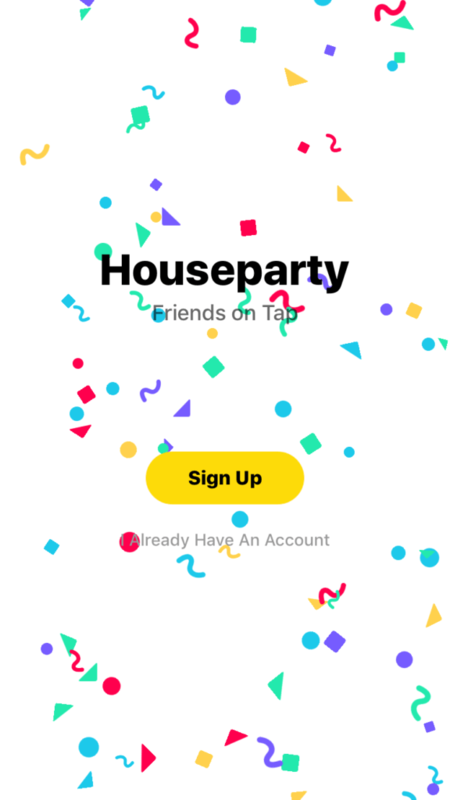 Houseparty gives each user an invite code that can be sent to anyone to invite them into a video chat “party.” If your child uses Houseparty, make sure they know your expectations about how this code is used. April 9, 2019 Update – Snapchat plans to power its Stories within Houseparty, so that kids using Houseparty could see Snapchat Stories content from friends without ever leaving Houseparty. Houseparty app BOTTOM LINE – Is it safe for your kids? What to do if a stranger shows up (“lock all rooms”). The importance of good behavior in live situations, which can be recorded. We are warm to Houseparty for the high school audience, based on the risk factors noted above. We’re really not wild about its glamorization of alcohol use – use of a plastic cup as the icon (which is commonly associated with drinking). its tagline of, “Friends on Tap,” or a recent “waving” feature at friends called “buzzing.” Just too many party references. But, in terms of how it’s used, it can be fun. Are you interested in having greater insight into the social media platforms that your kids are using? Bark is one of the best platforms we’ve tested. They’re constantly looking for ways to dig further into apps like Houseparty, to keep parents of the information that matters. We trust them and we think you should, too!